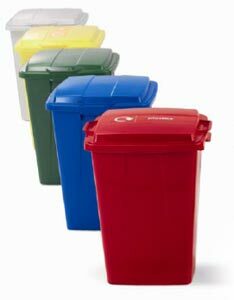 Bright and colourful range of recycling containers with optional lids and trolleys allowing colour coded source separation of waste materials. Two sizes are available, 60 litre and 90 litres. One colour of bin body (usually grey) can be used with different colours of lid. A wheel kit consisting of a base for the bin along with four casters allows easy movement.